The Fitch rating agency remains relatively optimistic about the Russian economy, saying $360 billion reserves and prompt state action support the country’s investment grade status. However, Russia’s rating could be revised in April, it added. Fitch currently remains the only rating agency from the so-called ‘Big Three’ that has kept Russia’s sovereign rating in investment territory at BBB-. But this could change next month, Paul Rawkins, a senior director at Fitch Ratings, said in a telephone interview to Bloomberg. 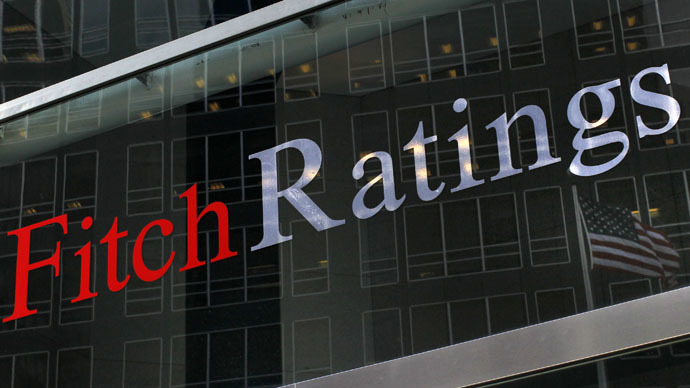 Fitch downgraded Russia to the lowest BBB- investment grade with a negative outlook in mid-January. However, the agency experts say reserves of over $360 billion are sufficient to contain the crisis. The rising surplus in the balance of payments along with a more realistic budget also supports Russia’s investment status. Rawkins added that wealth levels in Russia are higher than in other emerging economies with the same rating, such as India and Turkey. The economic pain is unlikely to lead to political discontent in the near future, he said. In January the agency stressed that a prolonged period of low oil prices, as well as the continuation of the recession into 2016, with negative consequences for public finances and the stability of the financial sector is a negative factor for the country’s rating. The uncertain outlook for oil prices and the risks of capital outflow add to the issue. According to Fitch forecasts, the Russian economy will shrink by 4.5 percent in 2015 and by one percent in 2016. “It could continue next year if sanctions remain on, the oil price remains low and if there’s no investment,” he said, adding that high inflation is expected to reach 17 percent by the end of 2015, a decline in real incomes and recession exacerbate the situation. The European Union and the United States share a single opinion that sanctions against Russia should remain in place, said Donald Tusk, chairman of the European Council on Monday in Washington during a meeting with US President Barack Obama. Last week the US announced extending sanctions against Russia for another year. In January S&P downgraded Russia’s sovereign credit rating in foreign currency to a ‘junk’ level BB + with a negative outlook. In February, Moody’s also lowered the rating of the Russian Federation to the speculative grade Ba1. The decision on a downgrade came despite the currency starting to bounce back and the Minsk agreements being reached. Russian Finance Minister Anton Siluanov then said the Moody’s downgrade was groundless and politically motivated. However, China’s largest rating agency Dagong rated Russia at a high investment A grade with a stable outlook, as it believes that the scale of Russia’s fiscal and foreign exchange reserves provides a necessary buffer for its economic outlook to remain stable.